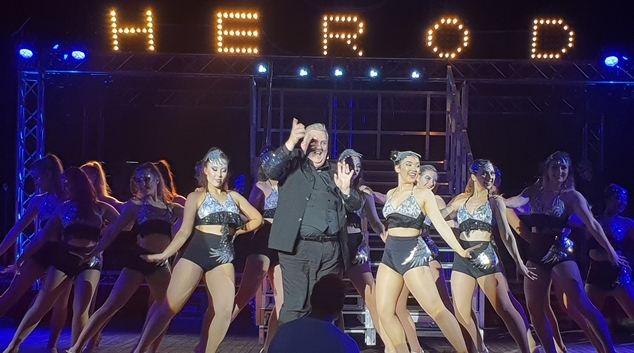 It was all buzz and glamour last night as Platinum’s Jesus Christ Superstar opened to an excited crowd at The Quarry Amphitheatre. The colourful and energetic re-imagining of Andrew Lloyd Webber’s classic didn’t fail to thrill, not least for its taking place in the 21st century – complete with regular updates of Jesus’ popularity on ‘Faithbook’ and a last supper courtesy of Uber Eats. Strong performances from Vin Trikeriotis in the title role, Sam Rabbone as Judas and Jamie Mercanti as Pilate ensured a seamless performance sure to please audiences throughout the show’s five-night run. Jesus’ groupies, styled 1970s retro-modern festival-goers, set the scene as they milled about on the stairwell waiting for the ‘Superstar Festival’ to kick off, as audiences took their seats. The Quarry’s super-wide stage loaned itself perfectly to the festival concept, with plenty of space for a Kombi van selling coffee (He-Brews), a bar and space for a choir which would go on to provide effective support throughout for show’s iconic score. The groupies successfully created buzz for the arrival of the man himself, who, to a powerful Heaven on the Minds from Rabbone in the role of Judas, appeared dressed in jeans, a white t-shirt and matching Converse – the perfect personification of Jesus as a modern-day rock star (and effective juxtaposition to Judas’ signature black). Soon we’re introduced to leader-of-groupies Mary Magdalene (Genevieve Wilson) who, through a personal favourite Everything’s Alright, demonstrated her suitability for the role, while assisting in the building of tension between Jesus and Judas. Instantly captivating, and throughout, were the chorus of dancers, whose skill combined with impeccable choreography kept energy levels at a high throughout the evening. The dancers effectively took on roles of adoring fans, townspeople and, later, the baying mob who demand Jesus be crucified. It was heartening to see a team of dancers of varying degrees of ability, with each given the opportunity to showcase her own strengths. The individuality of each performer made them a joy to watch. The creative team’s interpretation of Caiaphas and co, the team of priests out to destroy Jesus, as Priest Records producers questioning the musical integrity of their headliner, was a stroke of genius. Not only did the idea fit nicely with the Superstar Festival theme, it also gave a quiet nod to the macabre nature of record companies and their famously slimy executives. Each appearance of ‘the producers’ drew a smile, particularly at lines delivered in memorable baritone. Paul Whitehead’s King Herod’s Song was a highlight. I’ve always been a fan of the number, which provides some comic relief through its tongue-in-cheek cabaret, just at the right moment, when the storyline otherwise becomes a little grim. In this instance, Whitehead’s Herod is presented as a casting agent and, together with the dancers’ sparkly attire, gives the impression of a Vegas show, drawing appreciative applause from the audience. The setting of the last supper in the beer garden of Gethsemane was another clever nod to modernity, and showcased the impressive repertoire of Clay Darius in the role of Simon Peter. That the meal was provided by Uber Eats grew giggles from the crowd and I was pleased to see Mary Magdalene, as has been common practice in more modern adaptions of the show, sat at Jesus’ right. All in all, a very enjoyable evening out. The clever adaption ensured the ongoing relevance of the classic loved the world over. Jesus Christ Superstar will be at The Quarry Amphitheatre until Sunday November 4. Tickets available from Ticketmaster.